Not-So-Gentle Ben: A Single-Take Review of Bears! Imagine, you and your friends and family on a peaceful camping trip, deep into the woods. You're roasting marshmallows over the open fire, enjoying the fresh country air... But what's this? Oh. Just bears attacking your campsite. Yes BEARS!!! Bears is a dice-rolling game from Fireside Games for 2-4 players that takes about 10 minutes to play. So should you put this game on your table, or run screaming into the night? Let's find out! In Lanterns you'll play the part of an artisan charged with decorating the lake for the Harvest Festival in Imperial China. Lanterns is a really great-looking tile-placement game, with a very cool double-edged feature, in that each tile you place benefits you, and every other player in the game! We're going to be posting our preview of the game here very soon. Spoiler alert: It's good! Okay, Knizia's been working on some things--mostly iOS implementations of his games. But he used to come out with games all the time. And he's designed some absolute classics. So it's super exciting to hear about a new game from the Doctor! Fantasy Flight has announced Age Of War, a dice game for 2 to 6 players set in feudal Japan. "Each turn in Age of War, you must decide where to commit your armies against a castle. At the beginning of the game, fourteen castles are laid out, divided between six clans: Mori, Uesugi, Chosokabe, Shimazu, Tokugawa, and Oda. On your turn, you will attack one of these castles. Each castle card displays a number of battle lines showing different symbols. On your turn, you will attempt to conquer a castle by matching your dice results to the symbols in the battle lines of a chosen castle. Your turn begins by mustering your troops – rolling seven custom dice to gather infantry, archers, cavalry, and loyal daimyos to your attack force. Once your troops are mustered, you may attack a castle by matching the results of your dice to one battle line on the besieged castle. If unfilled battle lines remain on the castle card, you must reroll the dice to muster your troops again and press the attack. If, after any roll, you cannot fill a battle line on the besieged castle, your assault is thrown back. You must regroup your troops by setting one die aside, before mustering your troops again by rolling your remaining dice. If you can conquer a castle by filling all of its battle lines, you take the castle card and add it to your play area as one of your castles, and the castle’s point value counts towards your total score. But just because you conquer a castle doesn’t mean that castle is safe! You can attack other players’ castles on your turn in the same way you attack unclaimed castles, with the addition of the red daimyo in the upper left hand corner of the castle card as another battle line that must be completed to conquer the castle." The game is expected in the second quarter of the year. I don't know about you, but hearing about a new Knizia game fills me with joy. He was The Man when I got into this hobby, and it's good to see him coming back. What's your favorite Knizia game? Or favorite Knizia memory? Well here we are again, wrapping up another busy week at TOG. You'll be seeing our 2nd podcast episode pop up in iTunes really soon, (seriously it's uploaded, just waiting on the Apple folks to do their thing) and we thought, "Hey! 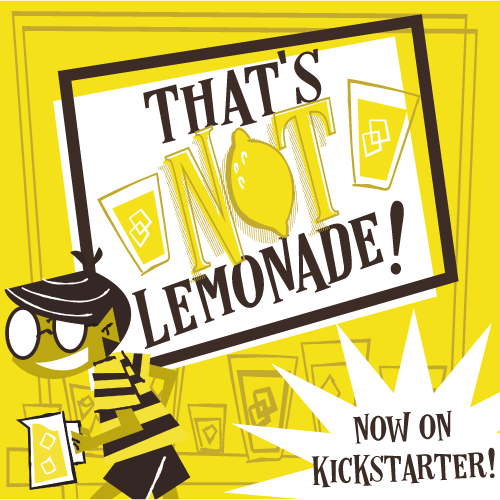 Let's do that Kickstarter Weekly thing that we do. So here it is. I'm drawn to this game for a couple reasons: It looks cool, and when I say "looks" I'm referring to the bright and shiny artwork; the game looks fun, too. Card-based area control, with some intrigue and influence tossed in for good measure. The campaign for this ends Oct. 10, and a pledge of $32 gets you a copy shipped to your door. You can find the campaign here. Galactic exploration for the sake of the future of Earth's population...in a board game. Lots of cool plastic minis included in this one. So if that's your thing, check this one out! It's a bit pricey though, so be ready. The campaign ends Oct. 20, and an $80 pledge get's you a copy of the game. You can check the campaign out right here. Because we needed another deck of cards to help us play Mafia and Werewolf, there's this campaign. The good news is, it's 8-bit type of fun, and it's an inexpensive campaign to jump in on. The bad news is, it's another Werewolf/Mafia iteration. A pledge of $6 will get you both decks, and the campaign ends Oct. 31 and you can check it out here. Thanks so much for reading us here on the blog, watching us on YouTube, and listening to us on our podcast! Let us know what Kickstarters you're backing in the comments below, or connect with us on Facebook, Twitter, and Instagram!